Those who demonstrate a high level of morale and motivation are more capable of higher levels of performance and accomplishment than individuals who feel unmotivated and who demonstrate a poor attitude. Being successful is not just a product of feeling motivated, it is also a contributing factor of motivation. If you are a team leader, you can boost the level of team-motivation and morale by giving your workers challenges that they can succeed at. 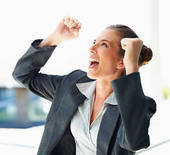 The more success that one experiences, the more positive, energized, and enthused one feels. When you feel successful you are more willing to take the risks and accept the challenges necessary for higher achievement than when you are going through the downtrodden emotional state of feeling unsuccessful. One key to boosting your motivation is to stop focusing on the goals that you are finding it impossible to achieve, and to clarify instead exactly why you want to achieve those goals. There is never really anything blocking your success other than excessive attachment to a particular goal. Whatever goal you want to accomplish, there are definite �sub-goals� that you believe will be reached if you accomplish it. For instance, if you want to make more money, it may be because you want to provide your kids with a great education. But you can enrich your child's learning environment and experiences in many ways, whatever your current economic level. If you become stuck on the goal of making more money, you overlook the opportunities for succeeding at satisfying your underlying reason for seeking that goal. The more you feel frustrated and unsuccessful, the more you lack motivation, and the more lack luster your performance and attitude are going to be. To be successful you have to feel motivated, and to feel the energy of motivation within you have to feel successful. So one way to motivate yourself is to clarify the underlying wants or needs you expect to be satisfied by achieving a particular goal that has been eluding your grasp. Then set to work on ways of succeeding at satisfying those wants and needs directly. Perhaps you want to achieve a certain goal so you can feel good about yourself, so you can feel like a success instead of feeling like a failure. But to improve your self-concept you can engage in internal self-work aimed at releasing you from feelings of low self-worth. You don't have to achieve an external goal to overcome a poor self-image. As you satisfy the wants and needs that you were counting on your goal to satisfy, you will feel better about yourself, feel freer, and feel more empowered to go for and achieve higher goals in life. Whatever it is that you want to achieve in life, you want it because you believe it will help you to satisfy some need or want that you associate with that achievement. We become too attached to a particular goal when we slip into discouragement in response to our unsuccessful attempt to achieve it. When you feel frustrated in your attempt to succeed at something, list some of the major wants or needs you expect to be satisfied by that success. Then look for ways to satisfy those wants and needs directly, WITHOUT having to wait until you reach that goal. For a higher performing team and a more motivated workforce that displays great moral provide team building trainings that include educating your workforce in how they can lead more success-filled lives by applying this �secret� to achievement, morale and motivation. Transform counter-productive employee stress into positive team work power. Morale and motivation Tips abound at our great Team Building Programs Inspiring Speaker events.